Clemson's first road contest of the season will come in conference play when the Tigers face Syracuse on Saturday, Sept. 14. 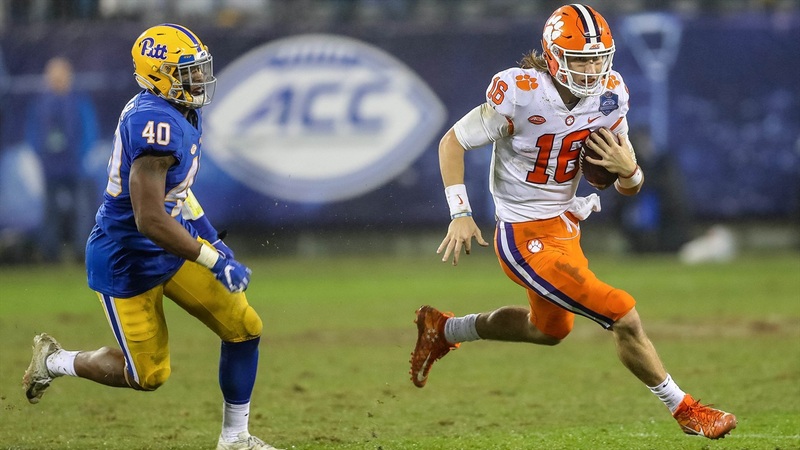 The Tigers defeated the Orange in memorable fashion in 2018, preserving their chance at an undefeated season by engineering a 13-play, 94-yard touchdown drive to earn the come-from-behind win last September. On Saturday, Sept. 28, Clemson will face North Carolina in the Tigers' first trip to Chapel Hill since 2010. The Tigers and Tar Heels have met three times since the teams' last contest in Chapel Hill, with Clemson going 3-0 in those contests including home wins in 2011 and 2014 and an ACC Championship Game victory in Charlotte in 2015. Clemson will return home for a second two-game homestand on Saturday, Oct. 26, and Saturday, Nov. 2, when the team faces Boston College and Wofford, respectively. Last season, Clemson defeated Boston College, 27-7, in prime time to secure the team's fourth consecutive ACC Atlantic Division title. The Wofford game represents a renewal of a series that dates back to 1896, when the first team in Clemson history earned a 16-0 victory against Wofford. Clemson's final ACC road game will be played on Saturday, Nov. 9, when the Tigers face the NC State Wolfpack. The teams met at Memorial Stadium in Clemson in 2018 in a battle of Top 25 teams, in which Clemson earned a decisive 41-7 victory. The 34-point margin of victory was Clemson’s second-largest in the 87-game all-time series between the two programs and tied for Clemson's second-largest margin of victory against a ranked opponent all-time. Clemson will conclude its home slate on Saturday, Nov. 16, against Wake Forest. The Tigers' historic offensive attack was on full display in the teams' 2018 meeting, as Clemson averaged 10.0 yards per play and recorded a then-school-record 11.8 yards per carry in a 63-3 win to post the largest margin of victory in conference play in school history. Following a second open date, the Tigers' will conclude regular season play on the road on Saturday, Nov. 30, against South Carolina. Clemson is currently in the midst of a five-game winning streak in the series. A win this season would pull Clemson within one win of the longest winning streak by either team in the rivalry (seven by Clemson from 1934-40). Clemson will open the season at home for the third consecutive season, the program's first time opening at home three straight years since 2009-11. Clemson is 92-23-8 all-time in season openers, including victories in nine of their last 10 season debuts. Clemson is 80-10-6 when opening a season at home, dating back to a 64-0 home win against Davidson by Coach John Heisman's Tigers to open the 1900 season. The opening contest represents Clemson's first time opening a season on a Thursday since facing Georgia Tech on Thursday, Sept. 10 to open the 2009 season. That contest also represented the last time Clemson faced a conference opponent in its season opener. Clemson's opener against Georgia Tech snaps a six-year stretch in which it opened ACC play on the road. Prior to 2019, the last time Clemson played its first conference game of a season at home was in 2011, when the Tigers defeated Florida State, 35-30, to start conference play. Clemson's Thursday night game against Georgia Tech will be the fifth Thursday game in Memorial Stadium history, joining Thursday contests in 1998, 2002, 2006 and 2013. It will be the first time Clemson has opened a season at home on a Thursday. Both Texas A&M and South Carolina are included on Clemson's schedule, marking the ninth time in the last 10 years that Clemson will play multiple SEC teams in the regular season. Clemson concluded the 2018 season having won 10 of its last 12 contests against SEC competition. Clemson's sixth win of the season would be its 750th in program history. Presently, only 14 FBS programs have won 750 games all-time (Michigan, Ohio State, Texas, Alabama, Notre Dame, Nebraska, Oklahoma, Penn State, USC, Tennessee, Georgia, LSU, Auburn and West Virginia).